For well over a decade, Jeanne has focused her practice in the areas of antitrust and white collar criminal defense, representing clients ranging from individuals to small privately-owned companies and partnerships to multi-national corporations. She has extensive experience litigating complex antitrust and criminal matters, including on appeal, and routinely counsels corporate clients on all aspects of antitrust and anti-bribery/anti-corruption law, including mergers and acquisitions, competitor collaborations, pricing and dealer/distributor issues. Jeanne routinely represents clients in matters pending before federal and state enforcement agencies, including the U.S. Department of Justice, FTC, FDA, EPA, SEC, Ohio Attorney General’s Office, Ohio EPA and Ohio DOT. 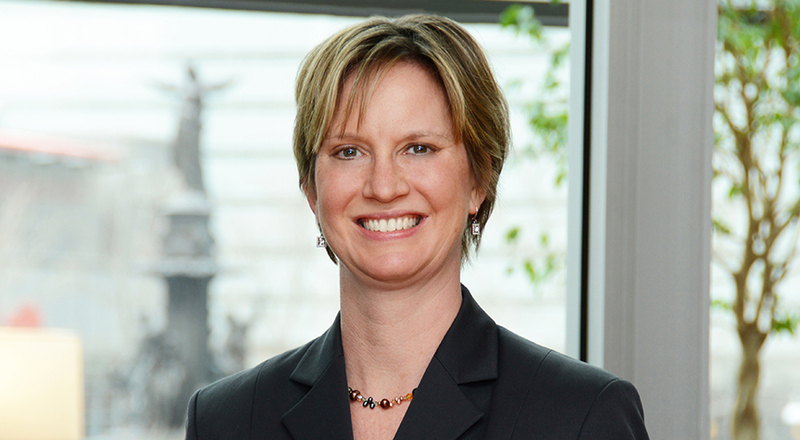 She has also served on a number of litigation teams in complex criminal and antitrust actions, including on behalf of Tokai Kogyo, Home City Ice Company, Duke Energy, Morton Salt, International Speedway Corporation, The Goodyear Tire and Rubber Co., Cincinnati Bengals and Barr Pharmaceuticals. Prior to joining Taft, Jeanne spent six years working as a legislative aide in Washington, D.C. to U.S. Senator Herb Kohl of Wisconsin. Jeanne is the past Chair of the Antitrust Section of the Ohio State Bar Association and the current Co-Chair of the Ohio Chapter of the Women’s White Collar Defense Association. 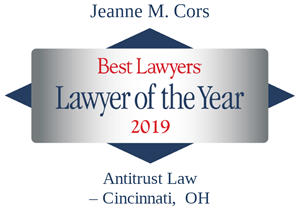 Jeanne has been listed in Best Lawyers in America® since 2009 and honored as the 2019 "Lawyer of the Year" for Antitrust Law. Benchmark Litigation, the definitive guide to America's leading business litigation attorneys, recognized Jeanne as one of the “Top 250 Women in Litigation” in the United States for 2013 and 2014. Benchmark Litigation also named her a Future Star in 2008 and 2012 and a Local Litigation Star in 2013-2018. She was selected as an Ohio Super Lawyers Rising Star in 2005 and 2006 and by Cincy Magazine as a "Leading Lawyer" in white collar crime (2018-present). Multiple Japanese auto suppliers investigated by the U.S. Department of Justice Antitrust Division for alleged criminal violations of the Sherman Act. After multi-year investigations Taft obtained declinations on behalf of two of its Japanese clients and their U.S. subsidiaries. A global manufacturer of healthcare equipment investigating its Indian subsidiary for possible violations of the Foreign Corrupt Practices Act. A national energy company investigated by the Department of Justice and Environmental Protection Agency for alleged violations of the Clean Water Act. The case was settled on favorable terms for the corporation with no action taken against the individuals involved. A CEO of a pharmaceutical distributor investigated by the Drug Enforcement Agency for diversion. A veterinary clinic investigated by the Drug Enforcement Agency for records violations and diversion. A client in a death penalty habeas corpus action in the SDOH district court and on appeal to the Sixth Circuit Court of Appeals. A client indicted on drug and gun charges in the SDOH district court and on appeal to the Sixth Circuit Court of Appeals. A senior level partner at KPMG indicted for violation of federal tax law. Following a 5-week jury trial in January 2013 the partner was acquitted of all charges. A former CEO of a Dayton, Ohio public company indicted for violation of federal securities law. Following a negotiated plea and contentious amount of loss and sentencing hearings the individual obtained a sentence significantly below the recommended United States Sentencing Guidelines range. A large manufacturer of packaged ice investigated by the U.S. Department of Justice Antitrust Division for alleged criminal violations of the Sherman Act. BASF Corp. on numerous class actions filed throughout the state of Ohio relating to alleged price fixing in the vitamins industry. "Federal Rule of Criminal Procedure 17(c) in Light of United States v. Rand,” American Bar Association, Online Section on Litigation, February 2017.